Name tags pair perfectly with any event. And that includes a wedding! While most decorations at a wedding are typically ribbons and cloth, name tags can play an essential part during your special day too. Here are a few quick ideas on how to incorporate these identification tools for your special day. Sometimes guests may forget where they set down their drinkware. Help them remember with simple glass tags. These tags are also great for seating arrangements. 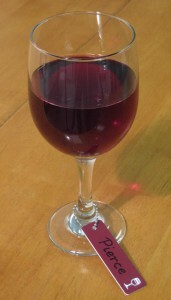 And, when everyone knows where their glass is, they will be ready for any toasts to the couple are made. Choose different colors for different types of guests. Use white to designate the bride and groom. Find a color that complements the theme and use that for bridesmaids and groomsmen. Many weddings have a multiple color theme, so use those colors to designate different things and people. From food designations to decorating for a beautiful evening, get your creativity flowing with custom signs and name plates. Add a name plate to the buffet tables to designate different meats or desserts. Or, customize a fancy table number with a small sign. Signs are also fantastic for displaying the bride and groom’s names at the entrance of the reception hall. 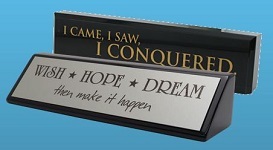 Display different signs around the reception area of favorite quotes or sayings. Or, create something unique to the couple that will help the wedding be memorable. Choose from an abundance of colors that will fit perfectly with any wedding. Add graphics and details, or add names for seating your wedding party. Looking for a super creative way to help your guests find their place at the table? This unique idea incorporates custom lanyards and name badges. 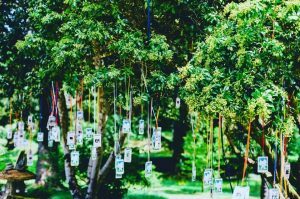 While this shows the place settings hanging from trees for the guests to find their names, they may also be spread out on a table. Choose a lanyard in your wedding colors and grab a handy badge holder to display people’s names and seating placements. Expressing appreciation and saying thank you doesn’t have to be hard. How often do we utilize all the tools we have? And how often do we realize the full extent of them? Sometimes saying thank you and name tags go hand in hand. That means these personalized tools don’t always have to be used as identification in a store or office. Name tags are so much more than that! And, to prove that notion, here are a few fun ways to let someone know just how much you care. Engrave a new name tag with someone’s favorite thing. 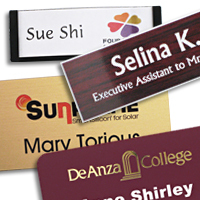 Make each name tag unique with an image or logo of someone’s favorite animal, outdoor activity, hobby or food. With several different available printing processes, engraving isn’t the only option here. Make it as colorful as you need with full color printing, or choose specific bright colors that will stand out with a UV logo. Name tags don’t just have to be for names. 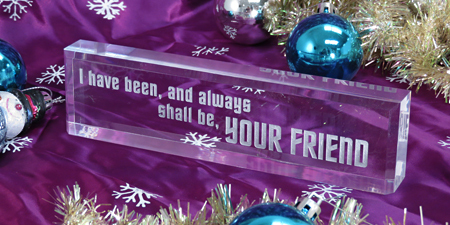 Give your best friend a new title such as “Greatest Friend Ever” or “Best BFF.” Choose their favorite color from the wide variety of plastic and metal materials and make your thank you just as unique as the recipient. Make your appreciation memorable with a personalized desk wedge. Sometimes just saying the words doesn’t feel like it’s enough. Whether it’s a job well done, or for a friend who has been there through the thick and thin, sometimes a thank you needs a little bit more. Choose from our unique desk wedges and acrylic blocks something that will suit just about anyone. Each wedge will feature a special message for that special someone. Sometimes, just remembering is the name of the game. While it is easy to remember to say thank you for many things, sometimes the little things go without notice. If you need a little help in recognizing to say thank you, try ordering a customized sign that will remind you on a daily basis to watch for those little things. Or, order a bunch of name tags with a simple engraved message expressing your appreciation and give them out to friends, family or co-workers. Name tags and other identification products are in our lives to stay, no matter what we think of them. Most professions these days make you wear or use a personal identification product. 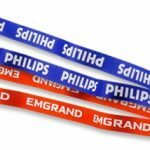 From name tags to name plates and even lanyards and ribbons, these items are becoming more and more popular in the workplace. And with that popularity comes the opposition of using these standard tools. So, how can you, as an employer, make them a bit more bearable for those that you require to use them? Let’s take a moment and reinvent this usage. First and foremost, a definition needs to be provided for why you are using personal identification products. What is your primary purpose for using these tools? Are you looking to provide company branding or making your employees more visible to your customers? There are several different ways to use identification. Office security, quick acknowledgment of employees, and office/desk labels are among the top reasons. A couple lesser known, albeit not lower in value, reasons are for identifying an individual for a job well done or to make it easier to remember someone’s name and their face simultaneously. But, no matter what the goal of this personal identification, there is always a way to make it better. The second step in reinventing this tool is to make it appeal to those who have to wear it. Make it flashy, but not so flashy that it’s an embarrassment to put on a name tag. 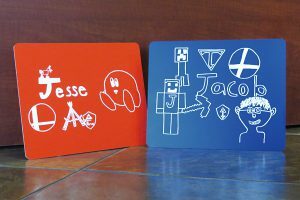 Add a logo and some fun colors to make a name tag pop. 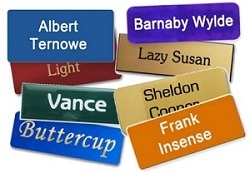 Or add a title to a name plate to make someone feel a bit more important in your office. Remembering the primary reason for personal identification will aid in making this second step easier. Once you put the required information onto a name tag, don’t forget the flair. Make it unique to your company or exclusive to the person wearing it. But keep them in mind when considering your design techniques. The final step is involvement. Keep your employees in the loop as to why they are being required to wear or use personal identification. While “it is part of your uniform” is a good reason, it isn’t the only reason. Make sure to communicate the importance of what that name tag means. Keep them informed, and they will be happier to continue to wear their name tags! 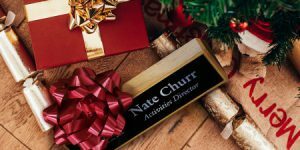 So, name tags, they are here to stay, and it’s your job to help others to see why they are so important!